In Texas, a rising conservative star takes on the establishment– Hoping to build on momentum from Richard Mourdock’s Tea Party-driven victory over Richard Lugar in the Indiana Senate primary earlier this month, the Tea Party is setting its sights on another possible win Tuesday, this time in Texas.In Tuesday’s Texas Republican Senate primary, Tea Party favorite Ted Cruz, a Cuban-American lawyer with strong conservative bona fides, is hoping to force a runoff against David Dewhurst, lieutenant governor to Rick Perry and the longtime establishment favorite. Former Dallas mayor and businessman Tom Leppert is currently running in third, while former NFL running back and ESPN announcer Craig James trails in fourth place. The four candidates are running for the seat being vacated by retiring Republican Sen. Kay Bailey Hutchison.The winner will go head-to-head with the winner of Tuesday night’s Democratic primary. Paul Sadler, a former state representative, and Sean Hubbard, a first-time candidate, are vying for that spot. In the deeply red state, however, the Republican nominee is expected to prevail in November. 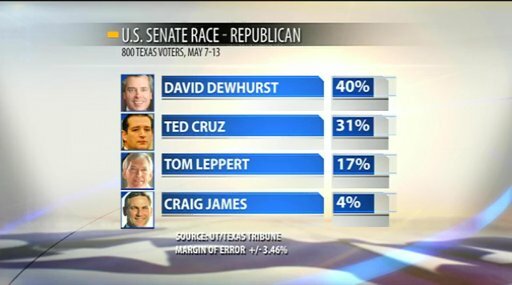 Recent polls show Dewhurst well ahead of Cruz, and the consistent front-runner in the race. But in order to avoid a run-off this July, he needs to earn at least 50 percent of the vote – a threshold he has yet to breach in recent surveys. If Cruz can maintain his second-place positioning and keep Dewhurst under the 50 percent mark, he could build on a recent surge in momentum and publicity. Texas Primary: What to Watch – Everything’s bigger in Texas, and today’s state and presidential primary is no exception. Mitt Romney is expected to reach (and surpass) 1,144 delegates tonight–the magic delegate number needed to officially win the GOP nomination. With 155 delegates at-stake, Texas’s GOP primary is the largest delegate prize in the contest so far–the second largest overall. California will offer the most delegates on June 5. The Dewhurst/Cruz race has been largely framed as an establishment vs. Tea Party battle, with Dewhurst labeled as the establishment candidate, and Cruz appearing to claim the tea-party mantle. Cruz has received endorsements from national tea party figures like Sarah Palin and Jim DeMint, but Dewhurst has numerous conservative endorsements as well such as Rick Perry and Mike Huckabee. Backers See Huckabee Filling VP Niche– If Mitt Romney’s most pressing consideration in selecting a running mate is to find someone who can expand his appeal among independents or a critical demographic that remains up for grabs, several candidates would likely fit the bill better than Mike Huckabee.But if the former Massachusetts governor instead concludes that his right flank is not as secure as it needs to be, Huckabee may be among his best options. Scott Walker recall: Wisconsin governor keeps low profile before vote– With a slim lead in the polls and just a week to go until the June 5 recall election, Scott Walker isn’t taking any chances.The Wisconsin governor is running under the radar in an attempt to freeze the race where it stands and limit the chances of a momentum-shifting mistake. Saudis Demand Punishment for McDonald’s Toy They Say “Insults Muhammed”– Saudi Arabians are angry at a McDonald’s toy which they say mocks their prophet Muhammad. According to a report appearing today (5/27/12) on the Arabic news website, Kermalkom.com,the McDonald’s fast food restaurant “abused the Prophet Muhammad by placing his name at the base of a toy that is being distributed as part of the Happy Meal, a toy which steps on the name ‘Muhammad. '”The toy consists of a blue superhero figurine (apparently a Power Ranger Samurai; click here for pictures). It stands on one leg, and, when the lever is pressed, it pounds on the base with the other leg. According to the Saudis, the designs that appear all around the base, where the figurine stomps its foot, is really the name “Muhammad” written several times in circles. Untitled (http://getglue.com/Fullosseousflap/stickers/amc/the_killing_72_hours?s=ts&ref=Fullosseousflap) – I unlocked the The Killing: 72 Hours sticker on @GetGlue! SWATting the Ericksons | RedState– Last week we spent a lot of time writing about Brett Kimberlin and the incident involving blogger Patterico where someone spoofed his phone number and told 911 he had shot his wife.Tonight, my family was sitting around the kitchen table eating dinner when sheriffs deputies pulled up in the driveway.Someone called 911 from my address claiming there had been an accidental shooting. Gregory Flap @ Ronnie’s Diner – foursquare – At Ronnie’s Diner with Alice, Tara and Nancy. Way better than Morton’s Steakhouse who gave @LizMair grief! 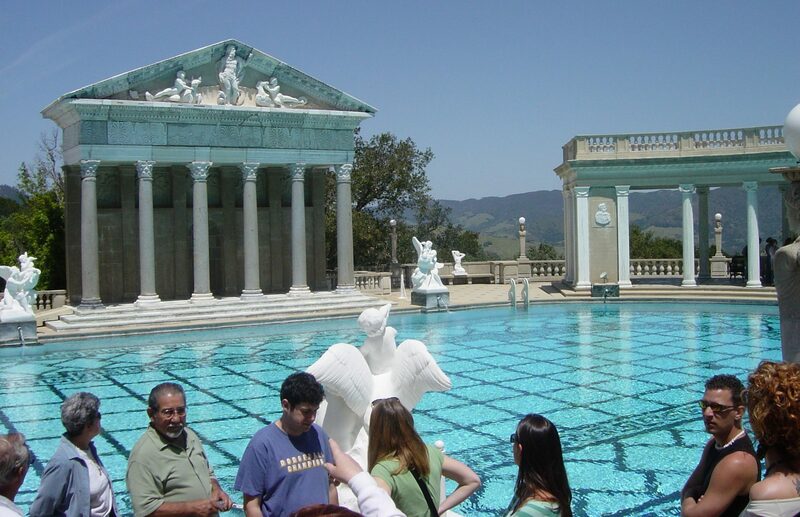 Flapsblog Posts / Memorial Day…. – Memorial Day….